If you’ve been to the grocery store this week, you may have seen more flowers than usual at the front door and also conveniently located by the check out lines. They’re strategically placed as a ‘gentle’ reminder to all – not to forget mom this coming Sunday. 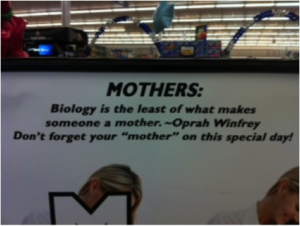 which reminded me… there are many women in the world who are not ‘biological’ mothers; maybe by choice, maybe not. There are also many women who act as role models and mentors, leaving an indelible mark and positive influence on those whose paths they cross and who are treated like a member of the family. Here’s to hoping everyone has a great ‘Mother’s Day’, no matter how you are connected to your ‘family’. And a special Happy Mother’s day to my mom!!! Thanks for all of the love and support you’ve shown us over the years! Back by popular demand …. #College101 and #Adulting101 will take place Tuesday, June 26! #College101 will be in the morning and over lunch (for seniors heading off to college). And #Adulting101 will be late afternoon into early dinner (for those transitioning to grad school or the ‘real world’). You can view details (date, time, pricing, topics, etc.) by clicking on the links below. Reservations are required and seating is limited! Please don’t hesitate to email or call if you have questions or need clarification. And, please feel free to share with your friends! Save $50 by registering now for a single season by June 1. Or save $364 by taking advantage of the Multi-Season Discount.